Someone asked me recently how best to set up a wireless router so that streaming and general internet use are both quick. Wireless is nearly its own field of expertise, and it gets complicated very fast. But I’ll do my best to keep things simple while still touching on the important stuff. For the sake of simplicity I’ll focus on home wireless solutions but the principles also apply to commercial applications. The first thing I must explain is how networking speed is measured, which isn’t really what I would call accessible or intuitive to average consumers. So without further ado, I introduce you to the bit. You’ve probably heard that computers all communicate with 1s and 0s. Well the bit is who you’re hearing about. It is an individual unit of data which is expressed by electrical impulses (1) or lack thereof (0). Then you’ve almost certainly heard of its family, the byte. A byte consists of eight bits. Humans typically use what is referred to in mathematics as a “base 10” numbering system (10, 20, 30, etc. ), especially in metric. Computers favour binary (1, 2, 4, 8…) and hexadecimal (1-9, a-f) so for the sake of simplicity, just trust me that there is a good reason that a byte has eight bits and that it makes sense to the computer. Next in the units of measurements would be kilobyte which is 1024 bytes, followed by megabyte which is 1024 kilobytes and then the gigabyte which is — you guessed it — 1024 megabytes. Why 1024? Binary math again. Just ignore it. The list goes on but I’ll stop there. Network speeds are measured in megabits per second (Mbps). The standard network speed for years has been 100 Mbps, but is leaning now towards gigabit-speed networks. This is sometimes confusing because the abbreviated form of megabits is Mb while megabytes is MB. So the important thing to note here is that to translate speed ratings into more relatable terms, one must convert megabits into megabytes. Or in other words, “how long will it take for me to download this movie?”. So to do that, we divide the number by 8. To save you the effort, a 1 Gbps network is theoretically capable of 120 Megabytes per second; a 100 Mbps connection capable of 12.5 Megabytes per second and so on. 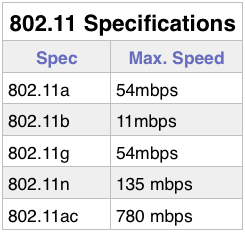 Wireless speeds are rated differently. The units of measurement are the same, but they have different speed standards that have improved between wireless technology generations. Wireless networks are governed by a communications standard with a not-so-catchy name: IEEE 802.11. 802.11 is the specification for general wireless, but there are several revisions of that spec. Keep in mind that this is an extremely simplified version of the wireless specifications. But as you can see, the general speed increments are a bit odd. 54 Mbps, 135, 780, and even these speeds are a bit of a misleading maximum. I’ll get to that in a bit. For now just keep in mind that the current standard is 802.11n and that would theoretically allow you to download 20 minutes of music in about one second if all the stars are in alignment. Wait, Why Does My Wireless Router Say It’s 300 Mbps? Good catch. In fact some wireless routers claim 450 Mbps. These use something called MIMO, which involves multiple antennas taking advantage of wireless physics to stream more data simultaneously. The speed of each antenna is still restricted by the wireless spec, but the overall effect is more speed and better range. However it is still plagued by some of the issues which I’ll now get into. The biggest problem with wireless presents as a result of physics. If you think of wireless like sound, you’ll get the idea pretty quickly. It doesn’t move very well through solid objects. This is why cell phone calls get dropped on elevators and driving in mountain ranges. The more solid the object, the worse the signal gets. Sure, you could yell through a wall and someone can listen and possibly understand on the other side, but no one will ever record an album that way. Wireless is so sensitive to solid objects that even furniture has a measurable impact on performance. Worse still, speed isn’t the only factor. Range is also a concern. Each wall, each floor, each piece of furniture between you and the wireless device will reduce both the speed and functional range of the device. So when you look at a wireless device and it says it has a range of say 200 feet, you can take that to mean that if you live in the prairies and place the device in the centre of a corn field, you may get adequate wireless for up to 200 feet in any direction (further complicated by the position of the antennae if they exist). Yet another problem with wireless is that not all specifications are what we call “asynchronous” or “full duplex”. These are fancy ways of saying that information can flow simultaneously in both directions. Humans typically take turns speaking and listening, but computers can handle hundreds, even thousands of “conversations” simultaneously. Wireless, unfortunately, is only half-duplex. So although the information travels very fast, the reality is that the speed is effectively cut in half to allow each computer to take it’s turn. But wait, there’s more! The “half-duplex” problem is bad enough when you’re dealing with one wireless laptop and one wireless Access Point (AP). Now put a handful of wireless devices and each one has to wait its turn to talk. This further reduces the perceived performance of the network for each user. Even more issues. Wireless is very susceptible to interference. In an apartment building, your wireless router has to compete with sometimes dozens of other devices competing — yelling over each other’s voices. That’s not even mentioning other devices like cordless phones, cell phones and even — and I’ve seen this firsthand — microwave ovens. Worse — it even interferes with itself! A natural radio-wave phenomenon called multi path causes transmitted information to bounce off walls, ceilings, and other objects, reaching the receiving antenna multiple times via different angles and at slightly different times. This forces the receiving device to wait until it has all of the transmission before re-sequencing the message in the proper order. Seriously, there’s more. There are some types of traffic that are particularly “noisy” and can dramatically reduce the performance of the network for everyone, and even crash the network in the event too much data is being handled for the AP to deal with (especially true of consumer-grade, off-the-shelf network equipment). This applies especially to things like torrents and video streaming. Enough Science, How Do I Make My Wireless Go Fast? Now that we know the most common issues with wireless internet, getting the best performance out of it is really about reducing or eliminating the problems. Fortunately there’s a solution to nearly every one. To maximize range, an AP should be placed in a central location with as few obstructions as possible. If there are dead spots, either a more powerful device is necessary, or more likely, multiple APs. By configuring the wireless to operate in the 5GHz frequency you can reduce or eliminate the interference from neighbours and other wireless devices, but with a small penalty to range. But interference has an impact on both speed and range anyway so it’s generally an improvement anyway. If you have many wireless devices in a network, the most ideal solution is to reduce that number. If a system can be wired, wire it. In some cases it’s most appropriate to have multiple APs and to distribute the load between them. With two APs, wait time is theoretically cut in half. However, having multiple APs does introduce a measure of interference but again, it’s a trade-off. Yes! Most quality routers come with something called QoS or Quality of Service. This allows you to set a priority for certain traffic types. So let’s say you have a VoIP (Voice Over IP aka an internet phone) system that you run wirelessly, and a family member who likes to stream videos and download torrents. This has a drastic impact on the quality of your phone calls: causing voice delays and dropped calls. Setting QoS can put that call traffic at a higher priority than all others, so that even if someone else is hogging all the bandwidth, the system will automatically throttle their traffic to give you what you need. Wireless traffic is usually encrypted — hence the need for a password for private networks. Even the method of encryption can have a dramatic effect on the quality, speed, and range of the internet connection. But wireless security is way beyond the scope of this blog post which has already bloated beyond what I had intended. Is There An Alternative To Wireless? I’m glad I asked. Yes! In an ideal world, all modern homes should be wired for networks at the same time and with the same attention as electrical. Sadly this is not the case even in newer homes, and adding that kind of wiring after the fact is usually way outside the budget. IEEE 1901 to the rescue! Without further bloating this blog post, I wrote about these PowerLine Ethernet devices years ago. Basically it hijacks your existing electrical system and takes advantage of electrical “noise” to communicate between devices. The theoretical speeds of these devices range from 200 Mbps to 500 Mbps but these have their own list of issues that reduce that performance in the real-world. Wireless is complicated. Very complicated. Some sites you can stick a AP to a wall and that’s all there is to it. Others need more fine-tuning, which is why I often lend my services to home automation companies to handle their more difficult wireless projects. By following the principles I’ve listed, you’ll eliminate the “low-hanging fruit” of wireless issues. Did I miss anything? Was this too complicated? Let me know in the comments.